In Rajya Sabha, Chairman M Venkaiah Naidu adjourned the House within minutes of assembling as Members of Tamil Nadu parties - DMK and AIADMK -- stormed into the well and Congress and treasury benches raised slogans. The Lok Sabha was adjourned thrice since it met in the morning, before being adjourned for the day. Parliament proceedings were disrupted for the fourth consecutive day Monday over the Rafale jet deal and Cauvery issues, leading to adjournment of Rajya Sabha for the day soon after it met, and Lok Sabha after passing a bill on transgender rights amid adjournments. He was countered by slogan-shouting from members of treasury benches who demanded an apology from the Congress after the Supreme Court gave a clean chit to the deal. The treasury and the opposition benches sparred over the Rafale jet deal issue with both sides raising slogans against each other. While the AIADMK raised issues related to construction of a dam over Cauvery river, the Telugu Desam Party (TDP) sought special status for Andhra Pradesh. Congress members raised the issue of government's stand in the Supreme Court over the Rafale deal and accused it of misleading the top court. BJP members, who were on their feet, raised slogans such as "Rahul Gandhi apologise" to counter the Congress offensive. Monday was the fifth sitting of the Winter session. 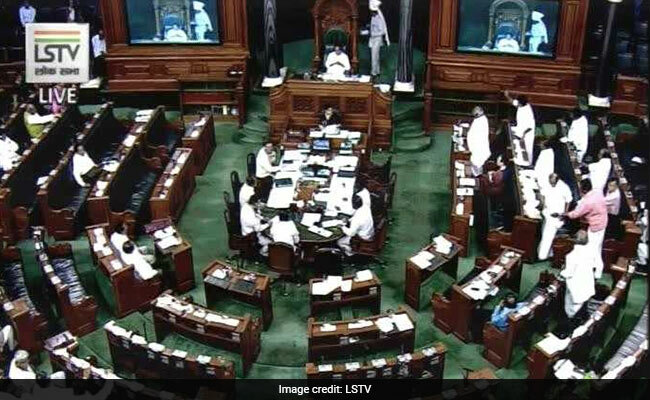 While on Tuesday last, the two Houses were adjourned for the day after obituary references to former prime minister Atal Bihari Vajpayee, Cabinet Minister Ananth Kumar and other sitting members, little business was transacted in the two Houses on Wednesday, Thursday and Friday. The Muslim Women (Protection of Rights on Marriage) Bill, which makes the practice of instant triple talaq a penal offence, was introduced in Lok Sabha after it met in the noon on Monday. It seeks to replace an ordinance issued in September. Amid slogan shouting, Congress' Shashi Tharoor opposed the introduction of the bill, terming it as unconstitutional. When the House met again after a second asdjournment, The Transgender Persons (Protection of Rights) Bill was moved for passage. Amid noise, five members participated in the debate questioning the provisions of the legislation. The 27 amendments moved by the government, along with some others moved by opposition members, were considered amid noisy scenes.